The Morning Line, an intradisciplinary platform for information congruence in public space created in 2008 by Matthew Richie, Benjamin Aranda and Chris Lasch was comissioned and publicly exhibited by TBA21 at two different locations – Sevilla (2008) and Istanbul (2010) – before settling in Vienna in summer 2011 as an artistic spatial and visual compound that aimed at unique symbiosis between architecture and sculpture, on one side, and sound content, on the other. Its delicate structure (10 meters high, 20 meters long, 20 tons heavy; 47 channels, 53 speakers) is being dismantled in the coming weeks to make its way to the Karlsruhe Center of Arts and Media Technology (Zentrum für Kunst und Medientechnologie, or shorter ZKM), where under the competent curatorship of Peter Weibel, as part of the permanent exhibition, it should be tested within a broader arts, media, science and technology project. The Morning Line was described by the architectural critic Sanford Kwiter as a “heroic delirium”, derived from the inventive application of the mathematical concept of fractal calculus, combined with most advanced and innovative video and sound technology. It is equipped with 46 loudspeakers and 12 subwoofers, controlled from a central unit, with adaptable volume and distribution facilities that combine with sensors and video-cameras into an interactive and live-performance scene, thus amounting to a single and unique interactive musical instrument. 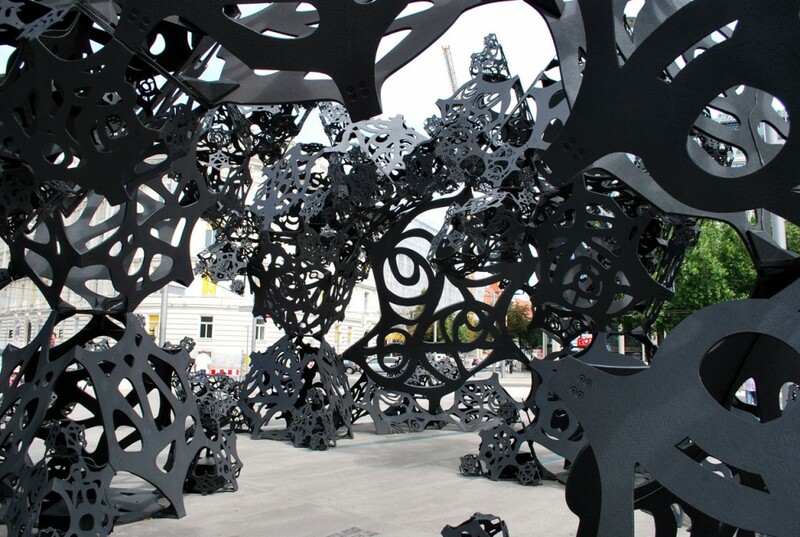 It has transformed Vienna’s Schwarzenbergplatz between summer 2011 and 23rd November 2012 into an attraction for art, music and architecture lovers. The Morning Line was as a scene for two festivals of the spatial sound and advanced music (in 2011 and 2012), and some fifteen new compositions, which shall be the core collection of the future Archive of the spatial sound and diffusion, were performed live here. According to founder and chairman of Thyssen-Bornemisza Art Contemporary (TBA 21) Francesca Habsburg, the future of the Morning line is not only that of a public art sculpture but also of an instrument of advanced music: “As such, it depends on being in an environment where it continues to be challenged by innovation and technology, and well as maintaining its concert program based on special commissions. The ZKM offers both of these and the general know-how and high level experience on how to work with sophisticated and challenging technologies. It is with great pleasure that TBA21 donates this exceptional work to the ZKM, in a direct agreement with Peter Weibel”.